Watercolor on ivory, 3 ¼ x 2 ⅝ in. Gift of Samuel P. Avery, John G. Brown, Thomas B. Clarke, Lockwood de Forest, Daniel Huntington, James C. Nicoll, and Harry W. Watrous, 1900. (NEW YORK, NY)—The National Academy of Design (NAD) is pleased to announce the national tour of For America: Paintings from the National Academy of Design, an exhibition created in collaboration with the American Federation of Arts (AFA). For America is the first exhibition to highlight the fundamental characteristic of the National Academy’s collection: the joint presentation of an artist’s portrait with her or his representative work. The exhibition’s 100 extraordinary paintings present not only a visual document of the Academy’s membership but a unique history of American painting from 1809 to the present. The eight-venue tour will commence on February 20, 2019 at the Dayton Art Institute, Ohio, and then travel to the following institutions across the United States: New Britain Museum of American Art, CT (October 16, 2019 to January 26, 2020); The Society of the Four Arts, Palm Beach, FL (February 15 to April 26, 2020); Dixon Gallery & Gardens, Memphis, TN (July 19 to September 27, 2020); New Mexico Museum of Art, Santa Fe (October 22, 2020 to January 17, 2021); Figge Art Museum, Davenport, IA (February 20 to May 9, 2021); Crocker Art Museum, Sacramento, CA (June 6 to September 12, 2021); and one additional museum. The exhibition is curated by Diana Thompson, Director of Collections and Curatorial Affairs, NAD; and Jeremiah William McCarthy, Associate Curator, AFA. Oil on canvas, 20 × 17 in. The first of five exhibition sections, Founding an American School, explores the origins of the Academy and the accompanying rise of the Hudson River School and American genre painting. 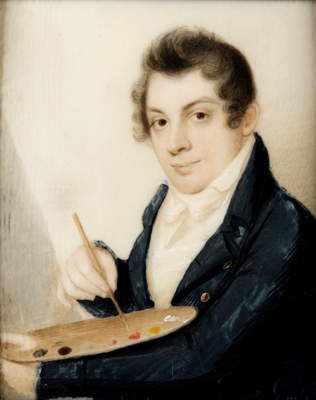 Asher B. Durand’s impressive Self-Portrait (ca. 1835) and Landscape (1850) provide an exceptional lens through which to view one of the Academy’s founders: the figures depicted in the latter work speak to the importance of artists’ relationships, one’s place in the natural world, and the power of interpretation. Other featured works include portraits of polymath and explorer Eliza Greatorex and noted landscapist Worthington Whittredge, as well as superb examples of this native school of painting from Albert Bierstadt, Frederic Edwin Church, and John Frederick Kensett. This section also provides the opportunity to view the earliest of Eastman Johnson’s self-portraits (ca. 1859-60) alongside a scene drawn from his series devoted to the American South. A New Internationalism reveals the impact of contemporary European art and art education on the pedagogy of the Academy and its associated school of fine arts. William John Whittemore’s striking portrait, Charles Courtney Curran (1888-89), provides an archetypal representation of the American artist in Paris, depicting the painter sketching from a classical statue at the Louvre. This section traces artists’ friendships and social networks abroad, with the intimate friendship of Robert Frederick Blum and William Merritt Chase as a telling case study. The two traveled throughout Europe together in the first half of the 1880s, frequently depicted one another, and were elected Associate National Academicians in the same year. While some of Chase’s critics perceived an aloofness in his figures, the artist’s emotionally stirring portrait of Blum forges a deeper connection between the duo’s well-known paintings The Young Orphan and Two Idlers, framing each in a new light. Painting America explores the Academy’s nascent role in the early twentieth century as the purveyor of artistic tradition in the United States. Strongly rejecting European modernism, the Academy compensated by widening its national base. This resulted in a geographically diverse and highly representative collection of landscapes and scenes of American life, from Daniel Garber’s New Hope School of Pennsylvania Impressionism to Ernest L. Blumenschein’s interpretations of the American Southwest. This section also explores the importance of intergenerational mentorship within the Academy, recorded visually in two works from the same year by the influential and important teacher Robert Henri and his student George Wesley Bellows, one of the most celebrated artists of his generation. Bellows’s Three Rollers (1911) was created alongside his mentor Henri on a trip the two took together to Maine. Postwar Realisms outlines how realism in its various incarnations remained a viable alternative to American abstraction, which dominated the postwar period. Highlights include Ivan Albright’s otherworldly Self-Portrait (1948), a melancholic yet visionary Self-Portrait (1945) from Andrew Wyeth, and Richard Estes’s photorealistic NYC Parking Lot (1969). Although women had been admitted to the Academy since its inception, at mid 20th century, the Academy broadened its membership to encompass a diversity of American experiences including artists of color. For example, the exhibition includes Charles White’s diploma portrait Matriarch (1967)—a portrayal of his great-aunt Hasty Baines, born into slavery in 1857 on the Yellowby plantation in Ridgeland, Mississippi. Painted 110 years after her birth, in the thick of a decade rife with political and social unrest, the deeply personal work stood for White as a symbol of wisdom and courage—universal themes also explored in his mature work Mother Courage II (1974). The exhibition’s final section, For America, presents paintings from living National Academy members whose work addresses contemporary concerns while harkening back to America’s storied past. This section shows that one of the most vital artistic legacies within American art is an undaunted commitment to realism, especially the figurative tradition, which has been championed by artists across centuries. The Academy is a living institution that counts 460 of today’s leading artists and architects as members, and paintings by Emma Amos, David Diao, Jaune Quick–to–See Smith, and Peter Saul provide mirrors for the present, ways of imagining and grappling with the past, and, finally, dreams for a possible future. Oil on canvas, 30 × 25 ¼ in. Oil on canvas, 31 ⅛ × 45 ½ in. Artists in the exhibition: Samuel F. B. Morse, Asher B. Durand, Frederic Edwin Church, John Frederick Kensett, Albert Bierstadt, Emanuel Leutze, Ferdinand Thomas Lee Boyle, Edward Harrison May, George Henry Hall, Daniel Huntington, Eastman Johnson, Oliver Ingraham Lay, Winslow Homer, Elihu Vedder, George Inness, Wyatt Eaton, William J. Whittemore, William Merritt Chase, Robert Frederick Blum, John Singer Sargent, Cecilia Beaux, Kenyon Cox, Maxfield Parrish, Thomas Eakins, Robert Reid, Childe Hassam, Frederick Carl Frieseke, J. Alden Weir, Albert Pinkham Ryder, Richard E. Miller, Henry Ossawa Tanner, George Bellows, Robert Henri, Daniel Garber, Gertrude Fiske, Mary Shepard Greene Blumenschein, Ernest L. Blumenschein, Walter Ufer, Ellen Emmet Rand, Guy C. Wiggins, Paul Sample, Isabel Bishop, Peter Hurd, John Steuart Curry, N. C. Wyeth, Reginald Marsh, Aaron Bohrod, Andrew Wyeth, Ivan Albright, Jules Kirschenbaum, Philip Pearlstein, Jane Freilicher, Hughie Lee-Smith, George Tooker, Richard Estes, Lois Dodd, May Stevens, Charles White, Will Barnet, Wayne Thiebaud, Reuben Tam, Rosemarie Beck, Paul Resika, Gretna Campbell, William Clutz, Louisa Matthíasdóttir, Altoon Sultan, W. Lee Savage, James McGarrell, Emma Amos, Benny Andrews, David Kapp, Jacqueline Gourevitch, David Diao, Walter Hatke, Albert Kresch, Ann Gale, Jaune Quick-to-See Smith, and Peter Saul. This exhibition will be accompanied by a richly-illustrated scholarly catalogue. Essays by a roster of distinguished historians and art historians, curators, artists, and architects delve into single artworks or pairs of paintings, while others explore themes such as the representation of landscapes and the figurative tradition in American art. Further contextualizing works in the exhibition, 18 current Academicians—such as Catherine Opie and Fred Wilson—contribute personal responses to individual artworks. In addition to the exhibition’s co-curators, essayists include writer and critic Jarrett Earnest; Jennifer A. Greenhill, Associate Professor of Art History, University of Southern California; Kenneth Haltman, H. Russell Pitman Professor of Art History, University of Oklahoma; Patricia Hills, Professor Emerita of American Art & African American Art, Boston University; Alexander Nemerov, Carl and Marilynn Thoma Provostial Professor in the Arts and Humanities, Stanford University; Susan Rather, Professor of Art History, University of Texas, Austin; Akela Reason, Associate Professor of History & Director of the Museum Studies Certificate Program, University of Georgia; Kimia Shahi, PhD candidate in art history, Princeton University; Elizabeth A. Spear, PhD candidate in art history, University of Iowa; Jonathan F. Walz, Director of Curatorial Affairs & Curator of American Art, The Columbus Museum; and Alona C. Wilson, Director of Collections and Exhibitions and Chief Curator, Museum of African American History, Boston and Nantucket. Diana Thompson is Director of Collections and Curatorial Affairs at the National Academy of Design. Presently, she is leading a major initiative to document and digitize the Academy’s entire permanent collection for the creation of a comprehensive online database devoted to the institution’s collection and membership. This educational resource is available to a global audience at nadatabase.org. Jeremiah William McCarthy is Associate Curator at the American Federation of Arts, specializing in American art. Most recently, he served as one of the three curators of Women Artists in Paris 1850-1900, a travelling exhibition presented at the Denver Art Museum, the Speed Art Museum in Louisville, and the Clark Art Institute in Williamstown, Massachusetts. For America: Paintings from the National Academy of Design is organized by the American Federation of Arts and the National Academy of Design. Support for the national tour is provided by the JFM Foundation, Monique Schoen Warshaw, and Steph & Jody La Nasa. The National Academy of Design has a simple yet powerful mission: “to promote American art and architecture through exhibition and instruction.” Founded in 1825 by a group of forward-thinking artists and architects who believed themselves to be the best agents for the advancement of the field, the NAD is an honor society of America’s top artists and architects—the National Academicians. Becoming a National Academician is a lifetime honor and one that cannot be applied for or solicited. New members are elected annually, totaling over 2,300 since our founding. National Academicians serve as ambassadors for the arts in America. They show work in our exhibitions, foster the next generation through our educational programs, and, in keeping with an almost 200-year-old tradition, contribute a work to our collection. The NAD permanent collection of nearly 8,000 works—unlike any other in the United States, shaped by the National Academicians themselves—represents one of the nation’s most significant and unique holdings of American art and architecture. Today, the National Academy of Design is in the midst of an exciting transformation—with newly-launched online resources, a reinvigorated Board and membership, and the establishment of our first-ever permanent endowment, we are re-envisioning what an Academy can be in the 21st century. Learn more at nationalacademy.org. The American Federation of Arts is the leader in traveling exhibitions internationally. A nonprofit institution founded in 1909, the AFA is dedicated to enriching the public’s experience and understanding of the visual arts through organizing and touring art exhibitions for presentation in museums around the world, publishing scholarly exhibition catalogues, developing innovative educational programs, and the fostering of a better understanding among nations through the international exchange of art.